To many foreign observers, North Korea is an odd place. With the succession of odd, little dictators, its dependence on China for aid and its determination to celebrate both its victories and its failures it always seems like one big Political House of Cards where one gust of reality will knock it down. Its attempt and subsequent failure to launch a rocket this week was still celebrated as a great triumph in the capital Pyongyang. Now this is partly because of the propaganda inbuilt into North Korean society where the glorification of its two former leaders, father and son Kim Il Sung and Kim Jong Il is more important than feeding its people but also because it plays into its ‘us versus the capitalist’ rhetoric. It has been studied apprhensively by the Western media to see how the third ruler of the ‘world’s only communist monarchy’ is coping since his father’s death in December and speculated over whether he can maintain the facade of progress while his country slides further and further away from the prosperity of the rest of the world. The theatrics of the past week suggest that these hypotheses were premature as the Korean propaganda machine rumbles on. 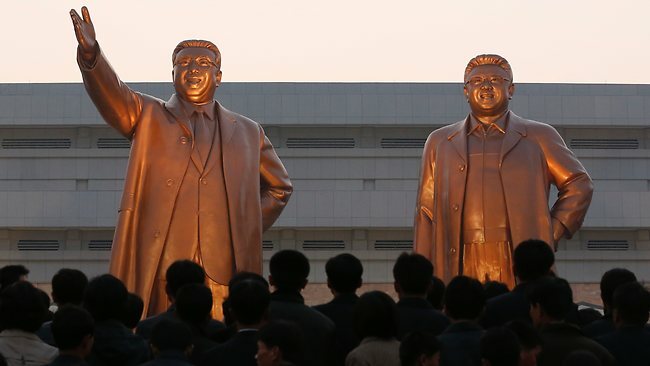 With a failed rocket launch and the unveiling of two gigantic statues of the two previous Kims in Pyongyang the ruling class and the masses that appear to follow them celebrated their actions as a massive success. And arguably they were. Although the rocket failed to get far beyond the Korean shore and despite what they told the masses; the elites’ ultimate goal in launching it was achieved. Deluded by the grandeur of their position and the false image they helped to create as they are, they would never have presumed that this rocket would have any effect or do any damage to the big, bad wolf over the border; South Korea. After all, they themselves admitted that the rocket broke up immediately after take off and celebrated anyway, clearly the objective was not to the use the rocket as proof of their regimes superiority, more that they were starting to take strides against their ‘oppressors’. Therefore, the purpose of the rocket was to the same end as the two statues being unveiled; they wanted to provoke a reaction. Much like the grotesquely large figures of the two preceding dictators are hardly a great contribution to the quality of public art the rocket launches were designed to give the Western powers the jitters and create a fresh wave of condemnation. As predicted, it worked. The UN Security Council deplored the launch of the missiles and accordingly the US cancelled a proposed food aid package to the country. White House spokesman Jay Carney, said ‘North Korea is only further isolating itself by engaging in provocative acts, and is wasting its money on weapons and propaganda displays while the North Korean people go hungry’. However are further sanctions and the continuing outright rejection of the North Korean regime the way forward? The established line in diplomacy is to condemn all aggressive and brutal regimes and cut them off from the economic community until they capitulate. However, North Korea has been isolated and starving since the ceasefire of the Korean War nearly 60 years ago and has yet to fall. Unlike one of its fellow South East Asian dictatorships, the Burmese junta which is attempting to loosen up its hold on power to curry favour with Western leaders, North Korea is for some reason unaffected by the plight of its people and will continue to act against the West. So why is the West still playing into their hands? The old diplomatic responses of condemnation and withdraw are doing nothing but confirming the North Korean propaganda of the capitalists at the gate wanting to destroy it. North Korea paints the outside world as full of greed and capitalist oppression; they maybe suffering but they are heading towards a ‘glorious’ future whilst the rest of the world is getting worse. They use the mentality of sticking together whilst under attack to keep the masses in line as they will always fear the alternative. Its power lies in the fact that despite this if they shout ‘Boo’ the whole world jumps back. If the supposedly all powerful West stops threatening the North Korea regime, maybe ordinary North Koreans might start to see that they have nothing to fear from the regime. A BBC video report that recorded some of the celebrations and Kim Jong Un’s maiden speech to his people remarked on the ‘absolute precision’ of the military parade and the slogans on every tank ordered ‘Death to the American Imperialist’. The diplomatic situation is manipulated to North Korea’s advantage; no matter how much the economic sanctions bite the regime manipulates its people into the importance of its ‘ideological struggle’. So what can the West do? It cannot continue with its current policy nor can it condone any of North Korea’s actions. So why not ignore them? Next time North Korea launch a rocket, why not let it go unacknowledged? Send the drastically needed food aid where it is needed and leave it at that. Instead of continuing to play the role of the bad guy in the North Korean pantomime we should show the North Korean regime that they do not scare us no matter how many military parades they allow foreign journalists to observe. Wow … maybe you should go visit South Korea before you start writing about the north. And then vote out the Obama-Clinton dynasty which got us in this mess with N Korea.